From matte black accents to black cabinetry, darker colors are adding a spa-like quality to bathrooms in 2019. This can be achieved with a simple renovation as opposed to a major bathroom remodel. Desirable Kitchens & Refacing, Pittsburgh’s experts in cabinet refacing, can reface your bathroom cabinets with a sleek, sophisticated black matte finish in 2-3 days. Add a black faucet or showerhead and your bathroom will have a whole new look and feel. If black is a little too drastic for your bathroom cabinets, you are in luck. 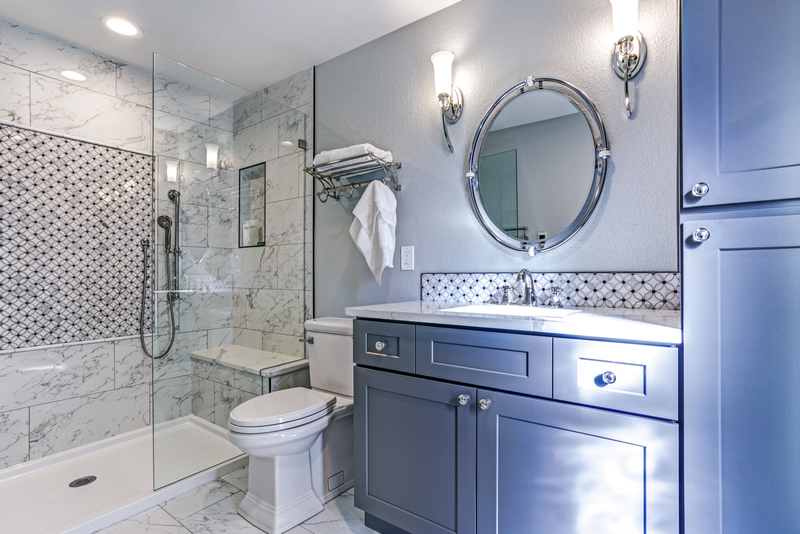 Gray cabinetry continues to be on the rise for bathrooms in 2019. Considered a neutral hue, gray pairs well with existing elements, as well as with all-white bathrooms or pops of color. With cabinet refacing, you can choose from a variety of gray stains and finishes for your Pittsburgh bathroom. An earthy, natural look is also taking over bathrooms this year. Gone are the days of the white, sterile look. Homeowners are adding a variety of woods—from driftwood to reclaimed barn wood—to their bathroom spaces. In particular, wooden vanities are on the rise. When it comes to technology in our homes, don’t forget about the most used room. It’s one more space where automation and technology has a place. Toilets with features such as hands-free, motion-activated seats and covers offer cleanliness and convenience at home. And the convenience doesn’t stop there with some models having adjustable heated seats, lighting and self-cleaning features. Hanging a piece of art or colorful wall accessory adds life to this high-traffic room. Often, your interior bathrooms do not have windows; therefore, the space is seeking attention. Incorporate different sizes, shapes, frames, etc. to make a bold statement. Just remember that moisture in bathrooms is inevitable, so don’t hang priceless pieces of art. Due to its porous nature, marble absorbs water quickly. Therefore, it is an excellent choice for countertops, floors or shower walls. Not only is it practical and durable, but its natural, unique beauty adds a design element like no other. Known for their function and small area, powder rooms are often overlooked when it comes to making a statement with the latest trends. In 2019, more homeowners are viewing these small spaces as blank canvases with huge potential. From bold colors to marble to the latest hands-free technology, these small areas are making big statements in homes today. If you are looking to upgrade your Pittsburgh bathroom with the latest design trends, call Desirable Kitchens & Refacing at 412-515-0582 for a free consultation. Our knowledgeable team will present the best options available for your bathroom’s transformation. We pride ourselves on having the right solution for every customer – every time!